Atlanta developer Robinson Weeks Partners has announced its third industrial development for the Titan Industrial Park in Schertz — and is planning for all three to be a charm. 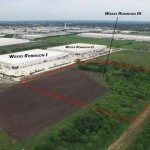 Through a joint venture with Titan Development, the two companies have plans for a 359,200-square-foot cross-dock distribution building for the 124-acre park, which is already home to two former industrial developments Robinson Weeks completed in 2014 and 2015. Enterprise Industrial – Building III is expected to break ground this summer and deliver in Spring 2017. USAA Real Estate Co. and Stream Realty Partners announced last month it would be teaming up for a new industrial development in New Braunfels. The I-35 Logistics Center, once completed later this year, will be a 397,000-square-foot warehouse with space to accommodate up to four tenants.